The battle between pro-and anti-GMO forces, as well as the controversy between loosening laws governing intrastate raw milk sales, shows no sign of abating. If anything, both topics seem to be getting more intense. In collaboration with Cary Frye, vice president of regulatory and scientific affairs at the International Dairy Foods Association (IDFA), I wrote a column this week for Food Business News entitled “Halting the raw milk movement.” (Thank you Cary.) You can read it HERE. The science is so solid on the power of pasteurization that even an eight-year old can understand it’s a technique to clean milk! Would you dare eat a piece of spinach right from the plant before washing it? I’ll admit I pop some blueberries in my mouth when picking in August in Michigan with the family, but don’t think that food safety does not cross my mind. It seems in this day and age with food safety front and center after Chipotle’s recent situations, and other issues with Listeria in ice cream and cheese and E. coli on leafy vegetables, consumers would want to err on the side of caution. Please take the time to read the COLUMN and share with your local media outlets. The time is right to set the record straight: Pasteurization is a necessary food safety technology. The time is also right to set the record straight on GMOs. Non-GMO is a personal choice, one that is appealing to an increasing number of consumers. There’s no denying this fact. But there’s no science to show that non-GMO ingredients are any better or any worse than GM ingredients. Packaged Facts reports in its study “Non-GMO Foods: U.S. and Global Market Perspective, 2nd Edition,” that in the U.S., 80% to 90% of such key crops as corn, soybeans and cotton are grown from GM seeds and there is little effort by anti-GMO forces to undo those facts on the ground. Instead, there is bitter conflict over attempts to have foods made using ingredients from GMOs labeled as such. The approach is very different in Europe and throughout the rest of the world where GM crops have been widely banned. Rather than focusing on labeling food products, an epic struggle is taking place over those bans. On one side are environmentalists and health advocates who would keep and extend the bans. On the other side are agricultural experts and the GM seed companies who want to see the bans removed. On both sides are farmers, non-governmental organizations and politicians of differing opinions, reports Packaged Facts. Unlike with pasteurization, which the Centers for Disease Control and Prevention has real, tangible data to show that between 1993 and 2006 more than 1,500 people in the U.S. became sick from drinking raw milk or eating cheese made from raw milk, the research on the safety or non-safety of GMOs is still a matter of personal opinion. There is science that shows that GMOs have caused no harm to human consumers in the two-plus decades that GMOs have been in use. But opponents reject the extensive studies cited. 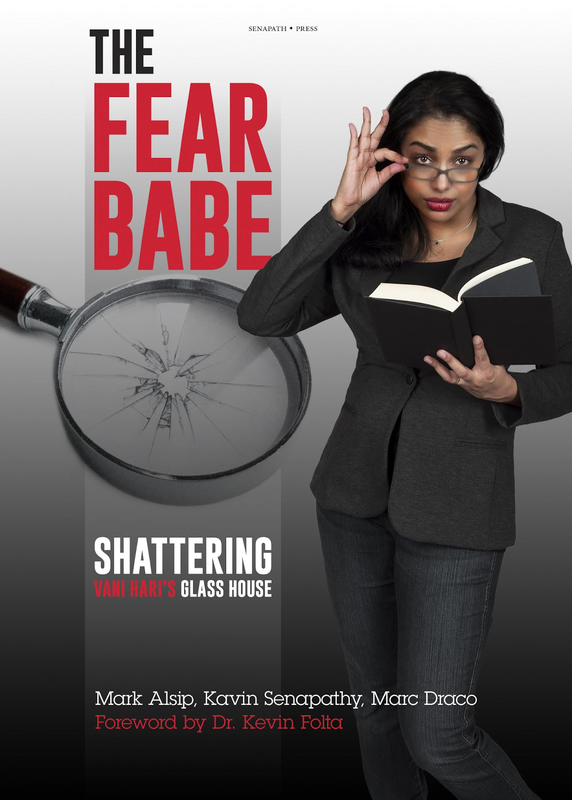 They question the validity of the research, noting a lack of peer review, despite approvals from leading U.S. and European health agencies, and suggesting that the period of use is too short to have provided adequate data. Here’s one fact that the dairy industry cannot afford to ignore. Packaged Facts estimates that retail sales of foods and beverages identified as non-GMO were approximately $200 billion in 2014. This represented about a quarter of all retail food and beverage sales for that year. Looking ahead, Packaged Facts projects that non-GMO food and beverage retail sales will reach $330 billion by 2019, an increase of 65%. In that same period, retail sales of all food and beverages will only grow by 13%. Organic and natural foods accounted for an estimated 60% of all non-GMO retail sales in 2014. Packaged Facts projects that this share will increase to about three-fourths of overall non-GMO retail sales by 2019. Keep in mind, while all organic foods are non-GMO, not all non-GMO foods are organic. For many dairies, organic formulation and certification is cost prohibitive. Non-GMO certification, which is provided by private organizations, or simply stating the use of non-GMO ingredients, in particular those on many watchdog lists (e.g., corn-derived ingredients), is a more practical option to attract today’s label-reading consumer. In early 2014, Whole Foods Market stopped selling Chobani yogurt. It was reported that this was because of the grocer’s newly adapted policy of only selling organic or non-GMO Greek yogurt. 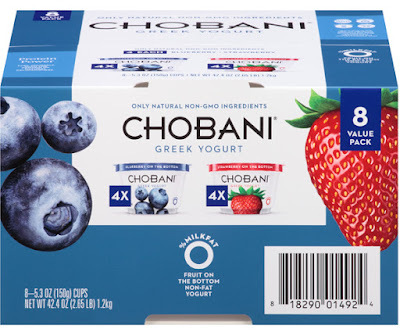 (Chobani says it was because of an exclusivity deal the retailer requested, one that did not interest Chobani.) At the time, some of the Greek yogurts sold at Whole Foods were made with milk from conventionally raised cows, most of which were likely consuming genetically modified feed. Whole Foods was under the impression that animal byproducts from an animal that has eaten GM feed is also GM. Read this again to fully comprehend its lunacy: animal byproducts from an animal that has eaten GM feed is also GM. That would mean any human—we are animal—who has ever eaten GM food is now a GMO! 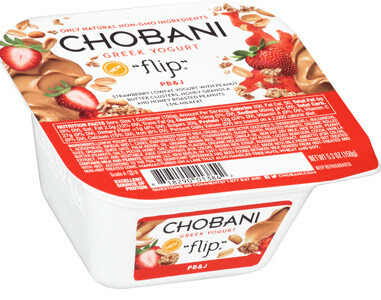 With that said, Chobani is changing its ways. The company says it is dedicated to increasing non-GM feed options and is building relationships with organizations and dairy farmers who are committed to GM feed alternatives. The company is sourcing, and says it has long been sourcing, non-GMO ingredients and has started stating this on packaging. 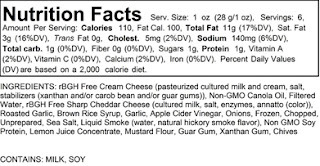 Rising Sun Farms identifies on its ingredient statements the use of artificial growth hormone-free cream cheese, and non-GMO canola oil and soy protein. To read more about “Strategies for sourcing non-GMO” ingredients, please read this article recently authored by Jeff Gelski, my colleague at Food Business News. Link HERE. Here’s a second fact. Two years ago Vermont passed a mandatory law requiring on-package labels of foods containing ingredients that have been genetically modified. This law goes into effect July 1, 2016. Unless Congress acts swiftly to provide a uniform standard for food labeling, food companies will be faced with hefty implementation costs, confusion across their supply chain and chaos marketing their products, explains IDFA. The implementation costs associated with this law and other state-based labeling laws would inevitably be passed on to consumers via higher prices that would hit lower income families the hardest. Dairy products are important nutritionally, and according to the most recent 2015 Dietary Guidelines for Americans, 80% of the U.S. population does not consume the recommended three servings a day. Unnecessarily raising the cost of dairy products for consumers will only exacerbate this public health problem. Just last week, Senate Agriculture Chairman Pat Roberts proposed legislation that would create a national uniform standard on biotechnology labeling and called for urgent action to take up and pass the legislation. The proposed bill would establish a national voluntary GMO-labeling standard to be developed by USDA within two years of the bill’s enactment. The bill would also prohibit any state from setting separate GMO labeling requirements, and also includes an educational component that will inform consumers about the safety and accessibility of information on agricultural biotechnology. “The bill proposed by Chairman Roberts provides a common-sense, national food labeling standard that brings consistency and transparency to the marketplace, and will ensure consumers have access to more product information than ever before without stigmatizing a safe, proven technology that is a central part of modern farming,” said J. David Carlin, IDFA senior vice president of legislative affairs. View a moving TV ad from the Coalition for Safe Affordable Food, of which IDFA is a member, released in January HERE. The broadcast advertisement, which ran for a week in the Washington, D.C., television market, focuses on the critical need for a national, uniform labeling standard for products containing GMOs. 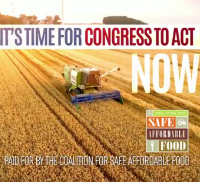 The ad, entitled “Do Something” urges Congress to find a solution to keep farmers growing and food prices low for America’s hard-working families. To read more about the Coalition for Safe Affordable Food, link HERE. A new economic study highlights the urgent need for congressional action to prevent food price hikes on families as a result of Vermont’s GMO labeling law…and it’s not just on Vermont families. The study, conducted by the New York City-based economic consulting firm John Dunham & Associates for the Corn Refiners Association, found that the Vermont law could increase the price of groceries by nearly $1,050 annually. This highlights the far-reaching impacts one state’s misguided law will have on the entire nation’s food chain and emphasizes the urgent need for Congressional action to prevent people already struggling with the cost of food from having to pay significantly more. The impacts of Vermont’s labeling law will vary state-by-state. For more information on these state-level impacts, link HERE. Here’s what you need to know about Vermont’s law. Vermont‘s effective date for compliance is July 1, 2016, which means unless Congress acts fast, if you want to sell product in Vermont, you need to be changing your labels very soon. Yes, you read that correctly. Animal products are exempt, to a point. White milk from cows fed GM crops or given a vaccine are exempt. But as soon as that milk changes, the rules change. If the sweetener used in flavored milk was derived from GM crops, now that milk must be labeled according to Vermont’s law. Here’s an example on how tedious the process is regarding compliance with Vermont’s law. 3. All other products made with any type of GM ingredient must bear the declaration “produced with genetic engineering” if they do not qualify for either of the other two declarations. There are more details to the regulation, including reference to the term natural in labeling and advertising. There are also very hefty fines for non-compliance. Around the time Vermont passed its GMO law in 2014, Vermont’s Finest, Ben & Jerry’s announced that it had transitioned all plant-based ingredients in all its ice cream flavors sold in pints, quarts, mini-cups and Scoop Shops to non-GMO. Still not free of GMO ingredients is the company’s ice cream bars. Here’s a recent introduction from the company: Cake My Day. This is vanilla cake batter-flavored ice cream with vanilla cake pieces, buttercream frosting and raspberry swirls. The ingredient legend reads: CREAM, SKIM MILK, WATER, LIQUID SUGAR (SUGAR, WATER), CORN SYRUP, SOYBEAN OIL, SUGAR, WHEAT FLOUR, DRIED CANE SYRUP, RED RASPBERRY PUREE, COCONUT OIL, EGG YOLKS, NATURAL FLAVORS, VANILLA EXTRACT, RED RASPBERRY JUICE CONCENTRATE, BUTTER (CREAM, SALT), PECTIN, VEGETABLE JUICE (COLOR), XANTHAN GUM, SOY LECITHIN, GUAR GUM, SALT, TURMERIC (COLOR), BAKING POWDER (SODIUM ACID PYROPHOSPHATE, SODIUM BICARBONATE, CORN STARCH, MONOCALCIUM PHOSPHATE), EGGS, CARRAGEENAN. 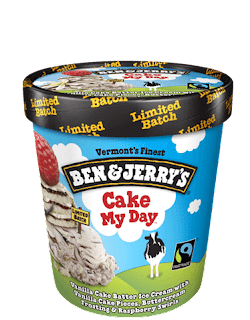 To read more about Ben & Jerry’s non-GMO effort, link HERE. It was wonderful to see so many of you in San Luis Obispo for the 18th Annual Dairy Ingredients Symposium this past week. Who knew at that first meeting 18 years ago at the San Francisco Hilton, which has long been replaced by an airport runway, that dairy ingredients, in particular, specialty whey proteins, would be such in-demand ingredients in today’s food and beverage industry? According to a recently released report from MarketsAndMarkets, the global dairy ingredients market is projected to grow at a compound annual growth rate of 5.6% from 2015 to 2020, to reach $59.8 billion. The major drivers of this ingredient segment are increasing awareness towards health and wellness, growth in application sectors, and R&D and innovations to expand applicability and accelerate growth. This is being driven by millennials who have unprecedented expectations of the food supply chain. They want customization, simplicity and transparency, but at the same time demand convenience, deliciousness and portability. 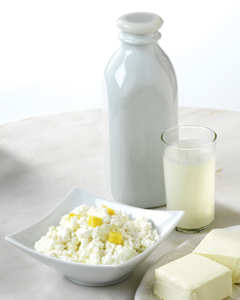 Dairy ingredients in dairy foods—for nutrition and functionality--deliver all this. The U.S. Dairy Export Council recently posted a blog entitled “Formulate a Clean Label with U.S. 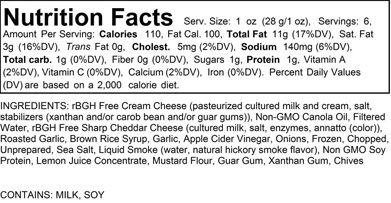 Dairy Ingredients.” You can read it HERE. Here are seven innovative dairy foods concepts made with dairy ingredients. From Indonesia, NutriFood Introduces WRP On The Go! These shelf-stable milk drinks are designed for health-conscious women on the run. Available in chocolate, coffee and strawberry flavors, the beverage is based on “cows milk, skim milk powder, whey protein isolate and full cream milk powder.” Fortified with fiber, minerals and vitamins, a 200-milliliter serving provides 150 calories, 3 grams of fat, 9 grams of fiber and 7 grams of protein. These high levels of protein and fiber are said to satisfy and satiate. In Finland, Valio recently introduced a range of products under the Valio ProFeel brand. Premier ProFeel Fat-Free Milk Drink contains double the amount of whey proteins found in mainstream milk, with 1-liter containing a whopping 50 grams of total protein. The product is basically skim milk fortified with whey protein. 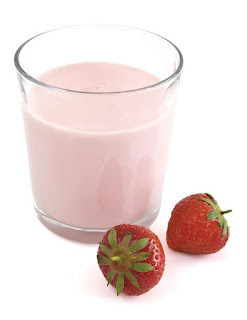 Filtration technology assists with the fortification and also renders the product lactose free. There are also two (chocolate and strawberry) ProFeel Protein Drinks. With no added sugars (the sweetening system is acesulfame potassium and sucralose) and no lactose, a 250-gram serving contains 20 grams of protein, which comes from low-fat milk and whey. There are also quark options in the ProFeel line. 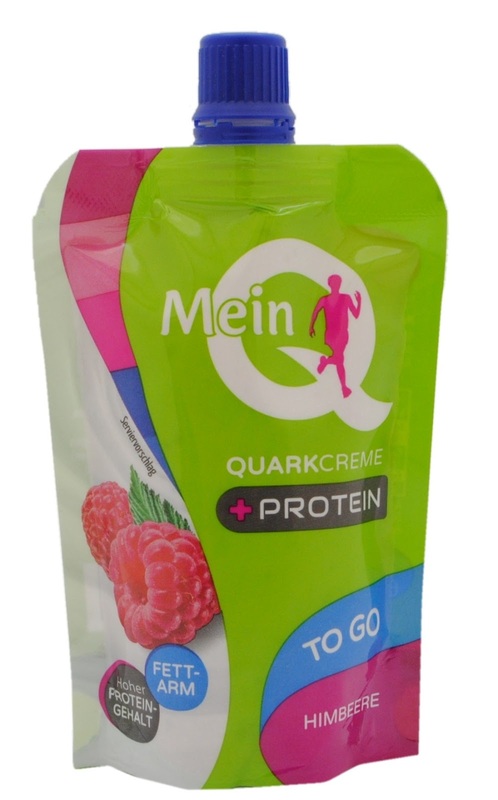 Speaking of quark, Heideblume Molkerei Elsdorf-Rotenburg AG of Germany recently introduced Elsdorfer Quark + Protein To Go. This low-fat, high-protein fitness snack is targeted to health-conscious active adults. The convenient 90-gram pouch allows for spoon-free eating. The formulation combines fresh soft cheese (quark) with whey protein to deliver 11 gram so protein per pouch. 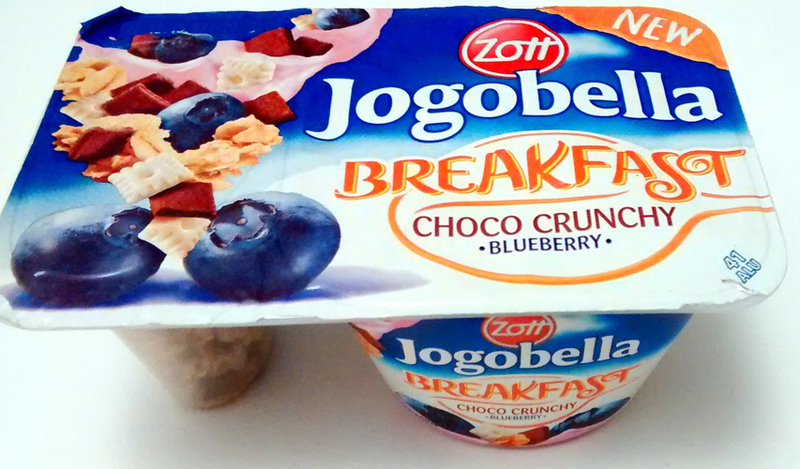 In Poland, there’s a new cultured dairy product option designed for the breakfast daypart. Jogobella Breakfast is a dual-compartment product with a protein-fortified yogurt-type product on one side and inclusions in the other. The cultured dairy food is made from milk, whey powder, milk protein and skimmed milk powder. Each 125-gram container provides 5 grams of protein. Varieties are: Banana with choco crunchy, Blueberry with choco crunchy, Peach with tropical muesli and Strawberry with a nutty muesli. 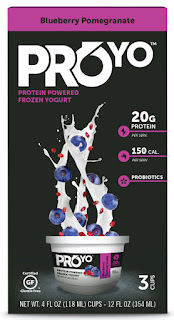 ProYo Frozen Yogurt was introduced about three years ago in 4-ounce squeeze tubes. This high-protein probiotic product has been rebranded and repackaged and will make its debut at Natural Products Expo West 2016 in a few weeks. The new package format is a 4-ounce single-serve cup sold in boxes of three. Each serving contains 20 grams of milk protein, live active probiotic cultures, added fiber and only 140 to 150 calories. ProYo comes in four varieties: Banana Vanilla, Blueberry Pomegranate, Dutch Chocolate and Vanilla Bean. It is based on skim milk, whole milk and whey protein concentrate. The new branding and packaging features a hint to future innovation. A sleek new trademark and logo not only hints at the original innovation behind the brand, but also speaks to the company’s future by de-emphasizing the “yo,” as ProYo plans to expand beyond yogurt-based products into new categories. It’s summertime in Cape Town, the perfect time to introduce new frozen dairy desserts. 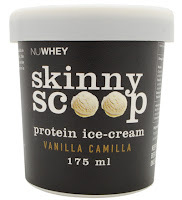 NuWhey is rolling out Skinny Scoop, the first protein-fortified ice cream in South Africa that is also free of added sugars, as it is sweetened with xylitol. 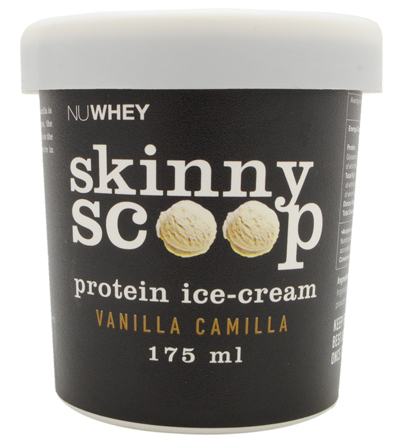 Skinny Scoop comes in two varieties—Afterdark Cocoa and Vanilla Camilla—and is made from cream, whole milk and whey protein isolate. A 175-milliliter serving contains 17 grams of protein. For many of us, summertime is right around the corner. Could this be the year of high-protein ice cream? The fast-food and frozen dairy dessert chain is featuring Red Velvet Blizzard Cupid Cakes for the Valentine holiday. Have a lovely one! During the past two days I was engaged with the Dairy Council of California Functional Foods Task Force (FFTF). This is a group formed 16 years ago (I was a founding member) and convenes annually to track changes in the external environment that affect the dairy industry. This 14-member group is composed of industry experts from around the country, representing food and nutrition research and development, academia, marketing, education and communications. Discussions ensue around nutrition and dairy research, public policy, regulations and consumer perceptions that impact dairy. Strategies are identified that Dairy Council of California and the industry can pursue to optimize dairy’s positioning in a rapidly changing environment. To learn more about this group, link HERE. We originally formed to focus on what was at the time the emerging area of functional foods and the role of dairy foods in this movement. Today the term functional foods is almost never heard, as the food industry has evolved to make functionality a given. Consumers have greater expectations of their foods, with nutrient density, wholesomeness, and fortification to bridge the gap for nutrients of concern expected. All foods perform a functional purpose, have it be provide calories for energy, nutrients to grow, or vitamins and minerals to reduce the risk of disease. That brings me to frozen dairy desserts, including ice cream, fro-yo and novelties. Every year I provide the FFTF a brief overview of recent dairy foods innovations. In the past, my presentation focused on so-called functional foods, those foods that provide benefits beyond basic nutrition. Such foods had typically been fortified with functional ingredients such as plant stanols and sterols, novel fibers, whey proteins, omega-3 fatty acids, resveratrol, green tea extract, botanicals and more. This year I explained to the group that there’s not much of that going on these days in dairy…except in frozen dairy desserts. These products historically have been all about indulgence and deliciousness. They are a dessert, a treat…but can they be more? With efforts to make refrigerated yogurt an all-day food, even a meal replacement in the evening by loading it up with nutrient-dense inclusions, some with a savory twist, why can’t frozen dairy desserts become something more, or, at the very least, a delivery vehicle for some extra nutrition? That might be something millennials want. Millennials were a focal point of our discussions at the FFTF meeting. Specifically, we focused on how this demographic is changing the way we produce, source and distribute food. We also discussed how millennials as a group often reject science-proven nutrition and food safety principles—they are the drivers of the raw milk movement—and often listen to their Facebook friends for dietary advice. The book’s title makes reference to the self-proclaimed Food Babe, Vani Hari, an attractive 30-something food activist from Charlotte, N.C., who, according to the authors, uses scare tactics rather than sound science to make food companies change their ingredients and business practices. Though too old to be a millennial herself, she preys on the millennial demographic and their rejection of science and Big Business. This infographic from BuzzBack provides some insight to how millennials think and what makes them tick. The market research firm surveyed 190 U.S. residents, ages 18 to 34, and found that they are all about balancing health and indulgence. Specifically, eight in 10 say it’s important to eat healthy and believe it’s good to indulge occasionally. This is a perfect opportunity for ice cream and like products to be repositioned as a healthful indulgence. According to a report rolling out later this month from Technavio entitled “Ice Cream Market in the U.S., 2016-2020,” the demand for healthier, more natural food has extended into the ice cream sector. This is being accomplished by manufacturers offering ice cream in smaller portion sizes, lower levels of fat and sugar, and fortified with functional ingredients such as probiotics and fiber. Technavio’s market research analyst predicts the ice cream market in the U.S. to grow at a modest compound annual growth rate of around 2% by 2020. The growing consumption of take-home ice-cream products is the primary growth driver for this market, with Millennials often the ones buying the decadent pint to enjoy while watching something on Netflix. Factors such as the emergence of ice cream as a snack and a rise in the availability of ice cream in unique styles and flavors will impel market growth during the estimated period. To keep consumers interested in the category, ice cream marketers need to differentiate themselves from others by innovating in packaging and formulation, as well as position in the marketplace. That’s what you get with this new product line rolling out by foxy’s. 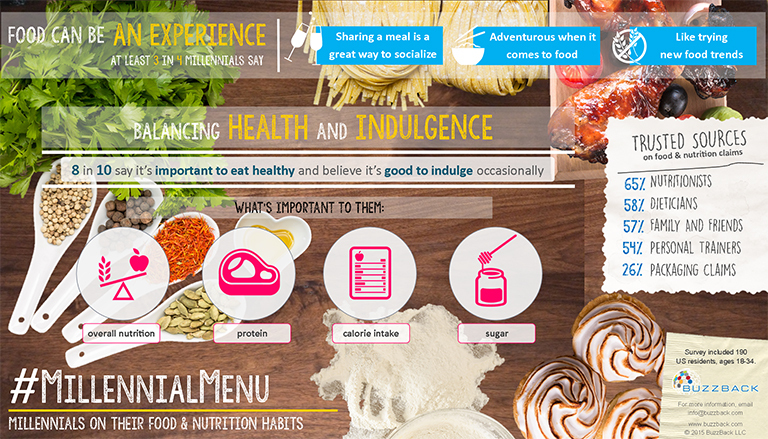 I first wrote about this company in August 2012 when it introduced a line of “playful and healthful” frozen yogurts. You can read about the product line HERE. The company is now rolling out what it calls “thoughtful ice cream,” a line of small-batch, probiotic ice creams with less sugar than most products in the marketplace. The line talks to millennials. You can’t tell the difference. In no nonsense, unique packaging. This is everything millennials look for in packaged foods. “We make foxy’s to order, meaning you have the freshest possible milk and ingredients,” he says. “It’s a range of very unique, premium 16% butterfat, 50% overrun ice creams loaded with more than one billion probiotics per serving and around 20% less sugar than comparable products. The company’s production process minimizes waste, reducing its carbon footprint. Only 60 pints are made per batch and containers are hand packed. There are 11 flavors in the line, many with whimsical names that speak to millennials. For example, with “6 Mile Almond & Honey,” the milk goes directly from the milking sheds to the farmer’s own plant. The almonds are from the same farmer’s land. The honey is from the beehives of the bees that pollinated the groves that provided the almonds. All this happens within a 6-mile radius. With other flavors such as “Rocky Road Less Travelled,” there’s a story behind the source of the ingredients, everything from the marshmallows to the nuts. For more information on foxy’s thoughtful ice cream, link HERE. As much thought went into the foxy’s products as the package. Minimal, simple graphics communicate what the products are all about. Implement limited-edition packaging, as millennials are always into the next trend. Millennials believe that the products they purchase and consume define who they are. Ice cream can do that. Happy Valentine’s Day weekend…and for many U.S. subscribers, enjoy your three-day Presidents’ Day weekend, too. The “need” to innovate was a focal point at the recent Dairy Forum in Phoenix. This is so very true with Greek yogurt. Consumers did not know they wanted Greek yogurt until Chobani introduced the American mass market to this high-protein dairy phenomena. The rest is history. Beau Mainous, chief customer officer at Chobani said during the same panel discussion that the speed of innovation is at an all-time high. He explained that in order to make what consumers want, it’s critical to get insight from many sources and act fast. I hope the Daily Dose of Dairy is one of your innovation tools. Working with ingredient suppliers is paramount, as product development timelines have gotten shorter and shorter. And innovation is constant. In the past, companies talked about product failure and success by longevity in the market. This is no longer the case. Limited-edition and seasonal products are the norm. A rotation of flavors and concepts is what keeps today’s consumers interested in a brand. Private-label retailer Aldi does a fabulous job in the U.S. of keeping consumers coming back for what’s new. If you have not been to an Aldi store recently, check one out. With very limited space, the store is constantly bringing in new products when others sell out. It stocks pantry and refrigerator staples, but in the category of dairy, you can always expect to see something new in cheese, dessert and yogurt. This keeps shoppers coming back and when a product catches their eye, they likely spend a little more than originally planned. 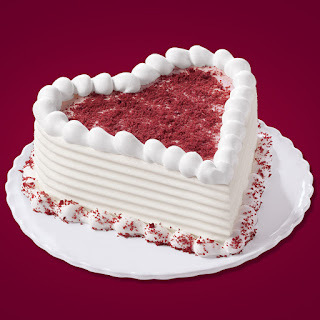 Here’s a perfect example of a product intended for the Valentine’s holiday. 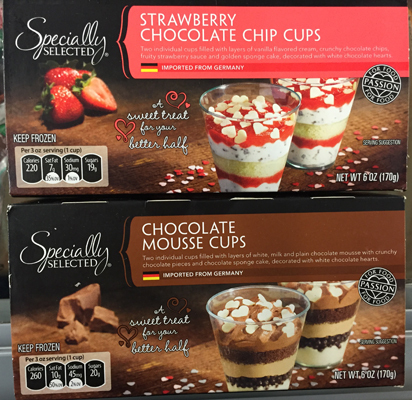 Sold in the freezer under Aldi’s Specially Selected brand, each box contains two dairy dessert cups. Imported from Germany, these desserts are intended for consumption once thawed. Chocolate Mousse Cups are layers of white, milk and plain chocolate mousse with crunchy chocolate pieces and chocolate sponge cake, all topped with white chocolate hearts. Strawberry Chocolate Chip Cups are layers of vanilla-flavored cream, crunchy chocolate chips, strawberry sauce and golden sponge cake, again, all topped with white chocolate hearts. At only 220 or 260 calories per 3-ounce parfait, this product invites shoppers to treat themselves, and to treat their better half. 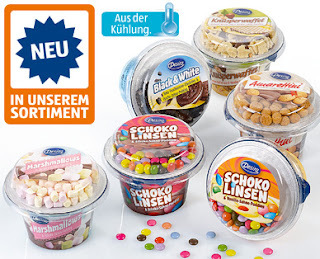 In German Aldi stores, the company has rolled out single-serve puddings with dome cups of inclusions. There are typical mix-ins of chocolate candies and crushed cookies, but also more premium indulgent ones, such as toffee fudge pieces and almond brittle. For youngsters, there’s even an option with mini marshmallows. In the U.K., Farmhouse Fare recently introduced Naughty But Rice, a line of single-serve rice pudding desserts described as “rice pudding, but not as you know it.” The 140-gram microwavable cups (enjoyed warm or cold) come in three varieties: Chocolate Orange, Coconut & Raspberry and Salted Caramel. Here are more products to inspire innovation. It’s time for you to zhoosh things up. 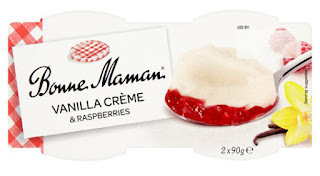 Bonne Maman, the premium jams and jellies marketer, is venturing out into the dessert business with new Bonne Maman Vanilla Crème & Raspberries. Sold in packs of two in the refrigerated dairy case, this dessert is a layer of vanilla cream atop a puree of gently cooked raspberries. Other new products from the company include: Rice & Raspberries, Strawberry Mousse, Strawberries & Cream, Chocolate Mousse, Crème Caramel, Crème Brûlée, Baba au Rhum and Crème Brûlée au chocolat. 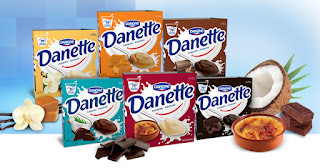 Danone Danette is a refrigerated pudding described as being made of 75% fresh milk. The healthful halo of milk gives permission for consumers to indulge, as the product delivers a dose of calcium and vitamin D (from fortified milk). New to the Canadian marketplace, the dessert comes in four-packs of 100-gram single-serve pots. 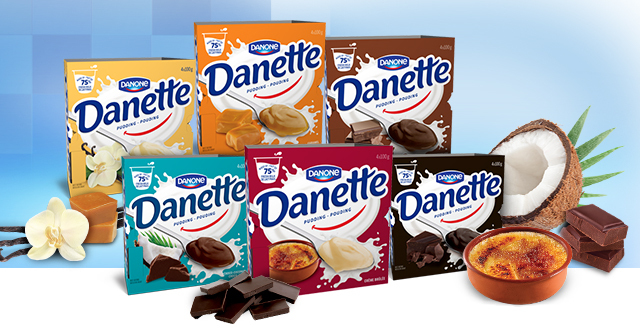 Danette has been a hit for a long time throughout Europe. Flavors include Cappuccino, Caramel, Chocolate, Crème Brulee, Extra Dark Chocolate and Vanilla. Each cup contains a mere 110 calories. Poland’s Mleczna Dolina builds on milk’s healthful halo by making a dessert out of kefir. Deser Kefirowy comes in 150-gram single-serve cups in three varieties: Cherry & Apple Jam, Strawberry & Apple Jam and Plum Jam. 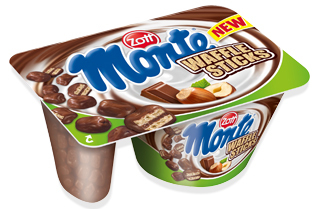 Zott’s Monte brand debuted in April 1996 and at the time was described as a completely new kind of dessert. It still is quite unique. Under development for more than two years, Monte is a combination of fresh milk-cream, chocolate and hazelnuts. During the past decade, the brand has expanded with new concepts and additional flavors. For example, Monte Plus starts with the original Monte combination and adds a layer of sauce. There’s also a dual compartment concept. Cacao Cookie, Cookies and Waffle Sticks recently joined Butter Biscuits, Cappuccino Balls, Cherry and Crunchy. Most recently the brand added Zott Snack, a practical snack slice for on-the-go consumption. The Monte Snack is the original Monte cream combination sandwiched between two light slices of cake.